Over Easter this year, we decided to give the infamous holiday traffic a miss and stay in Auckland over the long weekend. Instead, we left our cars at home, grabbed our bikes and camping gear and jumped onto the ferry Auckland to Waiheke Island. I thought it would be a biker’s paradise on the island since there are so many Waiheke Island bike hire places. But boy, oh boy, was I wrong! Here are my reasons, why you should not ride a bike on Waiheke Island, unless you are a biking pro, of course. And some ideas on what you can rather do instead. To be fair to the island, I did know from previous visits that there are many hills. What I never realised, though, was how steep they are! When you visit the wineries on Waiheke on a day trip, you usually either take the Hop-on/Hop-off Explorer or join a Waiheke Island wine tour and don’t really care about how steep it is. However, when riding the bike on Waiheke Island, the hills feel like little Mount Everests. Don’t expect to quickly get from A to B by bike, even if it looks close on the map. You might have made it from Matiatia ferry terminal all the way to Onetangi Beach with your bike. But the thought of riding back via on the ups and downs creeps the hell out of your already sore muscles? Good thing every local Waiheke bus is equipped with a bike rack in the front of the car, they will take you back to Fullers Ferry. Even though every bus can fit 3 bikes on their rack, it takes a bit of luck to find a driver who’s willing to take you and your bike. 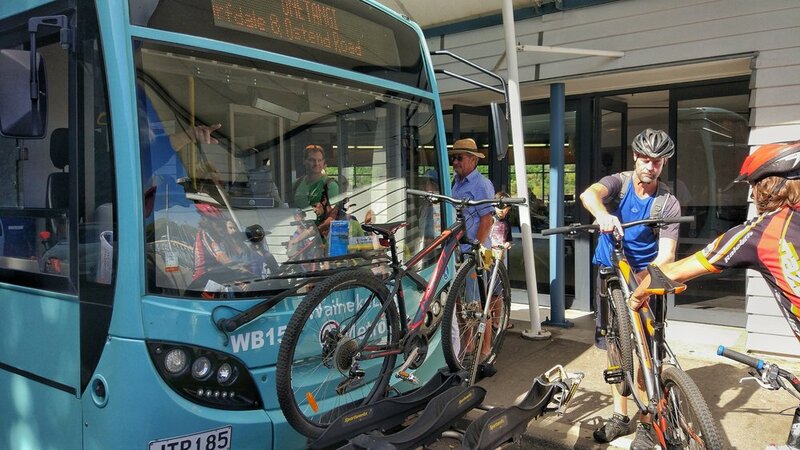 It’s a fact that it takes a while to load the bikes on the racks which can delay the buses, especially if you need more than one attempt to fix your bike on the rack. Plus the roads are narrow with a lot of traffic and according to the driver bike rack in use makes turning corners harder. All this causes many bus drivers to refuse your bike and you might end up having to wait for the next bus and try your luck there. And don’t even think about getting a Waiheke Island bus after dark. No bikes allowed on the racks of Waiheke bus company at night because they obstruct the headlights. Guess when I found out about this rule...I was in for a loooong ride in the dark. Cycling Waiheke Island is dangerous! There are almost no bike-only trails on Waiheke Island. Which means that most of the riding is either on the street or on small paths right next to the street. Most roads are very narrow and winding and there is surprisingly much traffic for an island. Buses, big cars with boats in tow, camper vans. Now imagine yourself on a bike, slowly climbing a hill. You have no chance of jumping to safety when they come racing around the corner! We did have a few near-misses and Chris once got a huge fright when a bus honked right behind him and overtook extremely close to us. The other reason why riding a bike on Waiheke is dangerous are the drink-drivers. There are over 20 wineries on the island, and they all offer wine tastings. It’s extremely tempting to drive from one winery to the next to be more independent compared to the tours. Now combine drink-driving with narrow, winding roads and a slow bike around the corner…Not much fun at all. Should you still not be convinced that biking Waiheke is not a good idea and want to bring your own bike, you can take them onto the Waiheke ferries for free. This counts for both companies going from Auckland to Waiheke, Fullers and Sealink. We will think twice about taking our bikes to Waiheke Island again. It really wasn’t a biker’s heaven as we imagined. However, we might give the island another try when we are going to explore the lesser-known eastern part. But we’ll bring a car will with us next time we bring the bikes, to get around easier when needed. That way, at least the steep hills aren’t such a challenge anymore. Plus your guide will lead you through places where it’s safe and on top of this, you get to learn about Waiheke Island, the wine and the Maori culture. Click to book your e-bike tour! If two wheels behind another sound too boring for you, how about a Segway tour instead? Trust your balance as you zoom along the vineyards and right into the sunset. Book your sunset Segway tour here! For those who can’t get enough of single trails, there is a small but charming mountain bike park on Waiheke Island. It has 8 trails that are mostly easy and intermediate, on a distance of 8 km. To get to the park, you’ll have to ride along the road for about 30 minutes (from Matiatia) or try and take a bus. There is a lovely loop on the lesser-known and visited eastern side of Waiheke. The Stoney Batter Track loop is approximately 17 km long, mostly on gravel and leads past three wineries (Man O’War, View East and Passage Rock). I suggest parking your car near the loop as the ride takes 4 to 5 hours and the ferry terminal is on the other side of the island. I know it’s not exactly the right alternative to biking. You came to this page because you wanted to be active, not just go from winery to winery and drink vino. But Waiheke and wine are so tightly knit together that I can’t not mention it. If you want to drink wine instead of riding, click here! You have the choice of the regular, local bus or the Hop On / Hop Off Explorer Bus. The Waiheke Explorer bus gets you to all attractions fast and with commentary. The local bus goes to the same places, but it might take you longer. Waiheke Island has its own long-distance walking trail, where you could circle the island. But you can also just follow parts of the Te Ara Hura Walk to get some stunning views over the island and Hauraki Gulf. 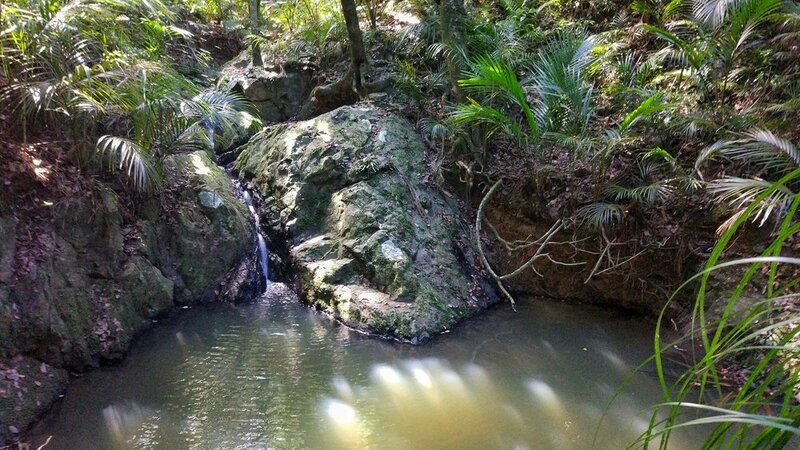 It’s also lovely to walk to the Cascades Waterfall Waiheke or walk between the vineyards from winery to winery. Click to read more about those walks and more things to so in Waiheke. The lovely cascades Waterfall waiheke. the walk was even nicer! If you like to travel bigger distances and are only on the island for a day, a Waiheke car rental might be a good idea. If you stay longer and have a car, it might be cheaper to bring your car over by ferry. You can easily spend a weekend or even longer on Waiheke. Many of the Waiheke hotels are small and charming, and some let you indulge in pure luxury. You’re really spoilt for choice. Have you ever explored Waiheke Island by bike? Do you share my point of view that you shouldn’t ride a bike on Waiheke, or do you disagree? Let me know in the comments below!